Acupuncture is a well accepted healing modality in the Western world today. Acupuncture gained popularity and recognition in the United States when the press followed President Nixon into China in 1974. There were representatives from major US news networks who witnessed and reported on several demonstrations of serious surgeries being performed with acupuncture as the only anesthetic. While these demonstrations didn’t teach the American public how Acupuncture works, it did make the term a household word and drove millions of people into clinics for treatments when conventional medicine failed. But Acupuncture is far more than just a pain-blocker….. it is one of the fundamental methods of healthcare in all of Asia, and one of the most profound healing modalities in the world. Acupuncture is an ancient Chinese healing technique that involves stimulating specific points in the body by inserting fine needles. Centuries ago the Chinese determined that inserting needles on specific body points helped restore the smooth flow of “qi”, or energy flow, through the body. Blockages or imbalance in “qi” was believed to result in pain and illness. Therefore in Chinese philosophy, the application of acupuncture extends beyond pain relief to the treatment of many other ailments. Over the years acupuncture as a healing modality has been widely accepted throughout Europe and North America, as well as the Eastern world. Today in the USA, many western medical doctors and medical facilities, such as hospitals, appreciate and encourage the use of acupuncture in conjunction with other western medical treatments. Acupuncture points lie along meridians on the body. Each meridian is associated with specific organs. At least 365 points are described in classical Chinese texts with a possible total of more than 2000. Generally only a small number of these points affect a particular ailment. An acupuncture treatment would include the insertion of one very fine needle at each affected body/meridian location. To enhance their effect, the needles may be twirled, connected to a weak electric current, or heated. Some practitioners, depending on the illness or imbalance, place small cones of the herb mugwort (MOXA) on the needle or acupuncture point and then burn it to produce a penetrating heat; this is called, moxibustion. 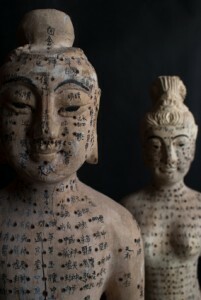 Other acupuncture techniques include “cupping” and “Gua Sha”. 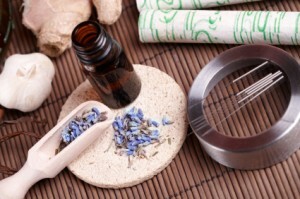 Of all the various alternative healing therapies, acupuncture has been studied the most. In addition to numerous anecdotal reports of its success and effectiveness, studies have demonstrated benefit in using acupuncture to treat chronic pain conditions such as arthritis, bursitis, headache, athletic injuries, and post-traumatic and post surgical pain. It is also used for treating chronic pain associated with immune function dysfunction such as psoriasis (skin disorders), allergies, and asthma. Acupuncture is also found to be effective for the treatment of mind-body disorders such as anxiety, chronic fatigue, irritable bowel syndrome, hypertension, insomnia, PMS, menopausal symptoms, osteoarthritis, low back pain, tinnitus ringing in the ears), toothache, menstrual cramps, nausea from chemotherapy, low energy and depression. Some modern application of acupuncture is used in the treatment of disorders such as alcoholism, addiction, smoking, and eating disorders. What is conclusive is how acupuncture works. Studies have shown that stimulating acupuncture points in turn stimulates the production of the body’s natural pain-blocking chemicals called endorphins. The therapeutic effects may result from the changes in the chemical balance in the body.